Instructions: Cut a piece of cream cardstock at 5 1/2 x 7 1/2 inches and 1 piece at 5/1/2 x 8 1/2 inches. Score this piece with the long side up at 7 1/2 inches and 7 3/4 inches and fold these lines. The end piece is 1/2 inch, glue the piece that's 7 1/2 inch on the 1/2 inch piece flap, now you have a double card of 5 1/2 x 7 1/2 inches. Take your Intricate Swirl Frame die and cut this one out of orange cardstock and glue this on the front of your card. Take 2 straws and cut them in 3 different lengths and glue them on top of the card next to each other. Stamp the large and small peony with the Morocco ink on white cardstock. Cut them out with the coordinating dies, color the large ones with Peanut Brittle in the center and very light Tangelo on the outside. For the small ones, use the Peanut Brittle in the center and the Buttercup Yellow on the outside. Lay them in the Flower Basic Shaping Mold, stamped side down and spray them lightly with water, then you can do another layer on top of that and spray them again, do the next layer and spray them, you can do 3 layers at the same time! Run them through your machine and shape them further with your Deluxe Flower Shaping Kit. I used 3 smaller and 3 bigger petals for the big peony. Shape the 3 smaller ones with the stamped side down, and the 3 bigger ones with the stamped side up side up, glue them all on top of each other, make a hole in the center and put your stamens through - use 8 stamens for the big flower and fold them double. Use 1 bigger stamen for the smallest peony, make 5 of them. Stamp the coneflower from the Blossoming Coneflower set and the Backyard Blossoms set and the Garden Edge Coneflower with Rich Cocoa on white cardstock. Color them on top with Tangelo and then Sunflower Yellow and a mix of Buttercup and blend these, put some glue on the top and sprinkle the decorative sand on it for the pollen. Stamp the tiny long flowers from the Backyard Blossom set with the Rich Cocoa and color them with the Sunflower yellow and the Leaf Green, cut them out with the coordinating die. Stamp the Rose Vines and the Leafy accents with the Rich Cocoa on White cardstock, color them with a mix of New Sprout, Leaf Green and Distress Peeled paint, cut them out with the coordinating dies and shape them with the Deluxe shaping kit. 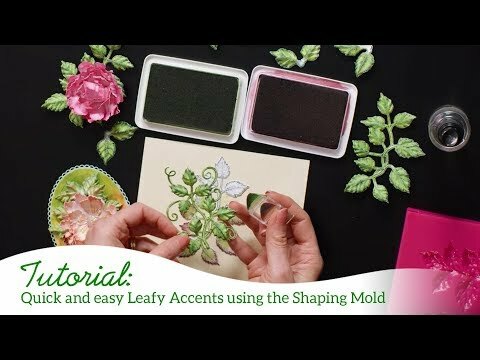 For the Leafy accent you can use the Leafy accent mold to shape your leaves. 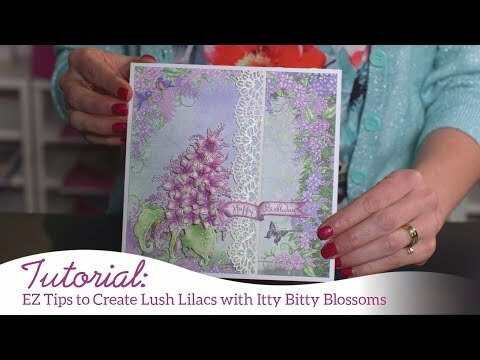 Stamp the Lush Lilac flowers with Versamark on vellum, sprinkle gold embossing powder over it and melt this with the heating tool, then cut them out with the coordinating die. Place them on your shaping mat and just press them in the middle, put some dots in the center with the Nuvo Dandelion Yellow. Stamp the bees from the Sweet as Honey set with the Graphite Black on white cardstock and cut them out with the coordinating die then color the body with Sunflower Yellow, Buttercup and Peanut Brittle. Take your black marker and make the black stripes on the body and add some Crystal Lacquer on the wings. Cut out the image of the bee with a scissors and add Shard Glass on top of it. Cut 2 black stamens in half and glue them behind the heads like an antenna. 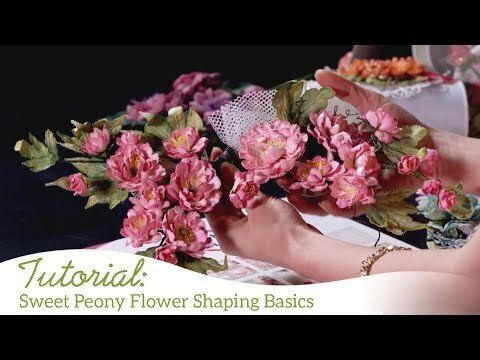 Glue the large peony in the center and then start to make a nice composition with all the flowers you have made, cut some leaves and flowers apart and adhere them in between the other flowers. 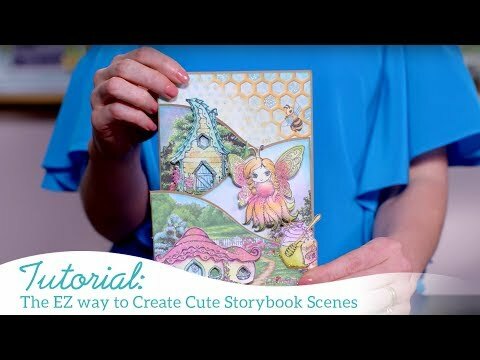 Glue the bee image on top of the large peony and add the small bees on some flowers. Glue some pieces of the string pearls in between the flowers too. Cut out a sentiment from the paper collection, mat on black cardstock with foam pads and adhere this on the right, upper corner.